Entrance for all concerts is free, donations are welcome. 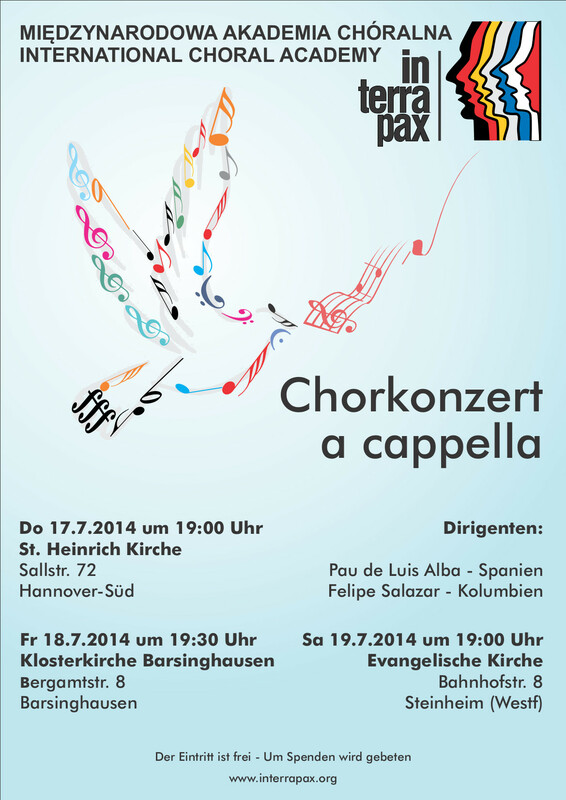 We will also perform on July 20th at 9:30 in a service in the protestant church Steinheim. The Schedule for the rehearsal week is as announced from Sunday June 22nd till Sunday June 29th. Jean-Baptiste can unfortunately not be with us this year, but we’re happy to announce that Szymon Wyrzykowski from Poland will be supported by Pau de Luis Alba from Spain and Felipe Salazar from Colombia. The planning for “in terra pax” 2014 is unfortunately still under way. As usual we will have our rehearsal week from June 22nd to 29th 2014 (Sunday to Sunday) in Miedzyzdroje (Poland). Afterwards we’re planning a concert tour to Germany likely from July 16th to 20th (Wednesday to Sunday). More details can be found here. We’re looking forward to another great itp year! Merry christmas and a happy new year to all members and friends of in terra pax. Planning and schedule for 2014 will be announced soon. The planning for “in terra pax” 2013 is under way. We still have to work out the details, but the dates will be June 22 to June 30 2013 (Saturday to Sunday) for the rehearsal week and July 1 to July 8 (Monday to Monday) for the concert tour to France via Germany. Mark your calendars! With concerts in Steinheim-Bergheim, Empelde and a mass in Ronnenberg, this year’s session of “in terra pax” is finished. The concert program can be found in the program archive. We were very happy with this year’s sesssion and hope to see you all next year! In terra pax is on concert tour in Germany this year. There will be two concerts, Friday July 20th at 7 PM in St. Liboriuskirche in Steinheim-Bergheim, and Saturday July 21st at 8 PM Uhr in Johanneskirche Empelde (near Hannover). We will also sing in a service in Michaeliskirche Ronnenberg (near Hannover) on Sunday July 22nd at 10:15 AM. Admission is free, donations are welcome. Welcome to our new website. We hope you like the new design. Please share any feedback or let us know if you found any mistakes.